We hoped you enjoyed your stay, please leave a testimonial or feedback here. "Simply the best. An idyllic gem of a place to stay with everything you could possibly want and more. Thanks Anne & Rob"
"Fantastic accommodation, everything and more in the Gardener's Cottage. Well done and many thanks Anne & Rob great job!" "Thank you Anne & Rob, lovely cottage - everything we needed. We have had a great sunny week. Thank you for the hamper too." "Definitely up there with the best cottage we have ever stayed in! Very well equipped, comfortable and quiet. Thank you Anne & Rob"
"Excellent, spotless accommodation and a warm welcome. Up with the very best. Thank you both." "Lovely cottage. Very well equipped. Everything thought of with some nice touches. A bonus for us was the beautiful garden to sit in on sunny days. Have had a great week. Thank you." "Wonderfully comfortable. Amazing attention to detail & lovely touch of the welcome hamper." "It is hard to describe the order, peace and comfort of these cottages. With a private garden and every conceivable convenience, they could not be overly endorsed. The owners have really created a cosy, delightful and warm space. Luxurious is a good description. We feel like we have found an absolute gem! If you are considering these cottages, just do it. You will be glad you did." "Thanks Ann & Rob, great stay, everything you need, plus lovely Kent x"
"Dear Ann & Rob, thank you for a lovely stay in your well equipped and clean cottage"
"Thanks for a lovely stay. Beautifully finished cottage & grounds, lovely area." "Another really enjoyable stay. 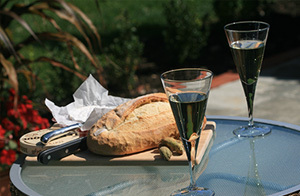 Lovely welcome & thanks for the goodies Anne & Rob"
"We had a very enjoyable and relaxing holiday in Gardeners Cottage. Very comfortable, cosy and well equipped. We were greeted by the owners Anne & Rob who made us very welcome. A welcome hamper was in the cottage. An excellent Park & Ride system is in operation for Canterbury costing only £3 for the day." "A lovely and comfortable cottage! Thank you very much for everything!!" "This has been a very enjoyable, relaxing stay. The cottage is superb! !It feels so comfortable in a beautiful setting. Thank you very much, it was great to meet you. Till we meet again." "We enjoyed our week at The Stables the property has everything you require, the bed was the most comfortable I have slept in. A great base to stay for exploring the area, I would definitely recommend this cottage." "We had originally looked at staying in the stables, but when we went to book, only the Gardners cottage was free. It was perfect for us. It has a lovely cosy feel, but with plenty of room. Very clean, every modern convenience and we loved getting to grips with the coffee machine and grinder! Just the thing to set us up for the day. Anne has the knack of thinking of everything you may need...even to the reading glasses in the draw! Would recommend and location for us was excellent to visit all the sites around. We look forward to a return." "We stayed in The Stables and had a really enjoyable holiday. After several recent disappointments it was a pleasure to find such a clean and well equipped cottage, with such friendly and welcoming owners. We would definitely recommend." "Highly recommended. First class accommodation and hospitality. We stayed in the Stables and everything needed for our stay was of the highest quality and spotlessly clean. Great location for visiting Canterbury, Sandwich & the coast. Would have no hesitation in staying in either of the cottages when we visit Kent again. " "We liked the Stables so much last year we came back and enjoyed another week this summer in this lovely space which has all you could wish for. Big comfy bed, well equipped kitchen and lots of thoughtful touches and useful things you might need. Wonderful goodies greeted us in a hamper on arrival and Anne is helpfullness itself. Love the outside patio and garden space too... you don't need to go out at all really!" "We enjoyed our week staying in The Stables which was beautifully restored and decorated. Anne and Rob extended a warm welcome which included a lovely food hamper with lots of goodies - a thoughtful touch. The cottage was very comfortable and was immaculately clean. Anne had thought of everything you might need to make your stay perfect. There was a delightful terrace to rear of cottage which looked onto lovely gardens - perfect for relaxing over breakfast. A great location for sightseeing in East Kent." "Beautiful comfortable cottage of excellent quality. A tranquil retreat." "Comfortable, cosy and spotlessly clean with everything we needed. Thank you for a lovely week." "We received a warm welcome on arrival. The cottage is well equipped and very comfortable. Surrounding gardens are well tendered. The cottage provides a good base for visiting Canterbury and East Kent. We really enjoyed our holiday there." "A delightful cottage in pleasant surroundings, with everything available to make a relaxing holiday. Convenient for the coast and towns of East Kent. A little gem." "We thoroughly enjoyed our stay in the Gardener's Cottage, even though it was only February. 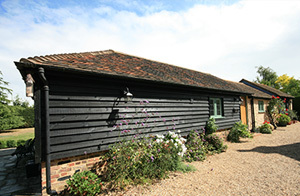 The cottage was lovely, very well equipped and immaculately clean, and well placed for visits to Canterbury and Sandwich. We found our hosts to be very friendly without being at all intrusive, and would certainly recommend the cottages for anyone wishing to spend time in this lovely part of Kent." "The cottage was the genuine experience. My wife commented that the owner, Anne, had thought of 'absolutely everything' in giving us a fantastic experience. Beautiful property, ideally located and very reasonably priced. Would definitely return." "We had a really happy time at the Gardener's Cottage and were very comfortable in the immaculate and well thought through apartment. The welcome hamper was delicious and we appreciated the friendliness. We hope to return in the future." "We visited Gardeners at Canterbury Cottages in August 2013 and that occasions was among the best cotttages we have stayed at in over 30 years of holidaymaking. We were warmly welcomed and taken care of from start to finish and the owners went out of their way to make our holiday enjoyable. The cotttage was finished to the highest specification and immaculately clean. Every detail had been thought of. This is a cottage we would highly recommend." "We had a wonderful week. The accomodation is immaculate & we were made to feel very welcome (including a nice hamper). Excellent location for exploring Kent - particularly Cantebury, Dover, Sandwich & the lovely beaches around Broadstairs. Highly recommended." "Thanks Anne and Rob for a very memorable stay at Gardeners Cottage. It was just what we were looking for. A cottage in a country garden with outdoor spaces and many extras provided. I would definitely recommend staying here." "A beautiful cottage in a quiet location, perfect for exploring Kent. 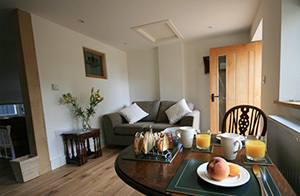 The cottage is furnished to a high standard with all mod-cons - nice comfy bed, A large shower and fully equiped kitchen. A welcome pack and fresh flowers are an added bonus. There is also a lovely garden. We had a enjoyable stay and would highly recommend this cottage." "We stayed in the Stables Cottage for 1 week and it was a beautiful one. The cottage is perfect restored and equiped. The bathroom, the kitchen, the living room, all perfect. In one word: First-class." "Stayed for 1 week in late July 2012. Ann and Rob very welcoming and accommodating - lovely hamper of local produce provided. Cottage and location really nice - very quiet and peacful, and with good road links to Canterbury and Sandwich. Cottage furnished comfortably (amazing bed!) and with all mod-cons. Very good value for money." "Stayed a week in the Stables. Had a totally relaxing and comfortable stay in this spotless cottage. Everything inside this cottage is to the highest standard making it a very pleasurable place to stay." "Anybody can book this property with confidence, it really is first class, and anne and Rob are a lovely couple and make you very welcome." "We stayed in the Stables for a few days while visiting family nearby. First impressions as we walked in was that the cottage had been newly converted - everything looked so spotlessly clean. A Welcome Hamper was waiting for us on the table with goodies from the local farm shop. The kitchen was well designed and the owners had thought of everything from simply boiling an egg to cooking for a full meal. The bathroom and large walk-in shower were immaculate (and I am fussy!). The floor was tiled thoughout but, even though the weather turned cooler during our visit, the Stables was always beautifully warm. Set back from the road there was no traffic noise. With the most comfortable bed we slept so soundly. It was our first visit (and certainly not our last), Anne and Rob made us feel so welcome. We have stayed in several rental properties before but this one certainly stands out from the majority. A lot of thought has gone into making guests comfortable but it is the little extras that make this one exceptional. It really deserves a 5* rating." "For the past 7 months I have had the greatest pleasure in staying in the Gardeners Cottage. I can highly recommend the accommodation as near perfect. The attention to detail within the property is to a very high standard, extremely well maintained, serviced and cared for. For me the whole experience has been warm, friendly and it is with great regret that my time at the cottage came to an end. Both Anne and Rob the owners have afforded me the utmost hospitality, friendship, care and consideration. I simply cannot thank them enough for the highest level of professionalism they have shown me during my stay, and I would highly recommend a stay at their Cottage."